We both wanted to slow down and bit and get out of the rat race. We had built up a fair bit of equity in our house and were considering downsizing to a cottage or enjoying the live aboard lifestyle. Attending the Discovery Day enabled us to decide that life on a narrow boat was definitely for us. The day was brilliant, the best anniversary present I've had in twenty four years. 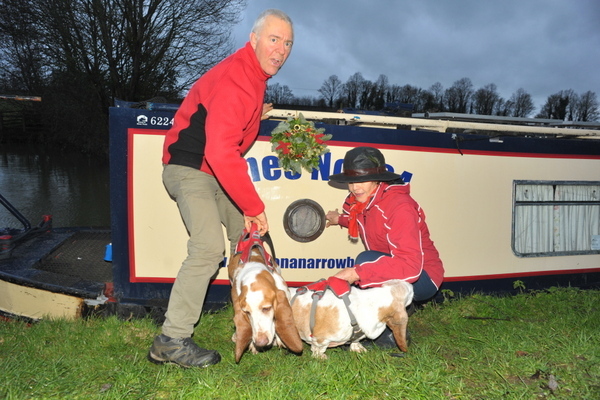 You should have been directed to this page because you or a very generous person close to you has booked a combined discovery and helmsmanship day on board our boat, a 62′ narrowboat designed along the lines of the working boats which cruised sedately along England’s canals two hundred years ago. You will learn all about life afloat and, more importantly, steer a twenty-tonne narrowboat on an eight hour, twelve miles, six lock cruise along one of the prettiest and most peaceful canals England’s magical inland waterways network has to offer. If you haven’t scheduled a date and don’t have the slightest idea what a narrowboat discovery day is, you can find out more here. Our cosy floating home. Maybe you’ll have one just like this soon. Cynthia will be here, greeting you will a sunny smile and a cup of something hot. We are Paul and Cynthia Smith. I (Paul) moved onto my first narrowboat in April 2010. At that stage, my boat was a mess. My floating homes needed extensive refurbishment before I was able to use it for extensive off grid cruising. I worked at a Calcutt Boats, a prominent inland waterways business, for five happy years before I left for a life of gentle exploration on England’s network of canals and rivers. I met my wife, Cynthia, in September 2015. She’s a southern California girl used to blue skies and odd people. I couldn’t match the weather she was used to but the canals had plenty of weird and wonderful folk to make her feel at home. Sadly, our wonderful government didn’t want her to stay. “Go!” they demanded, “and don’t return until you have the correct paperwork.” I didn’t want Cynthia to go on her own, so I sold my boat and left England with her. That was in October 2016. We drove twenty-seven thousand miles through eleven countries, living full time in our 25′ Hymer motorhome. We tired of living on land and purchased a classic mahogany and steel cruiser for exploring Holland’s vast waterways network. We purchased a bigger boat with the intention of living afloat in Europe full time. We learned at great expense that Dutch boats aren’t designed for winter living and that, after twenty-four months, windmills, tulips and dykes aren’t nearly as appealing as England’s shallow and narrow canals. England’s inland waterways boating called us back to the home of my birth. 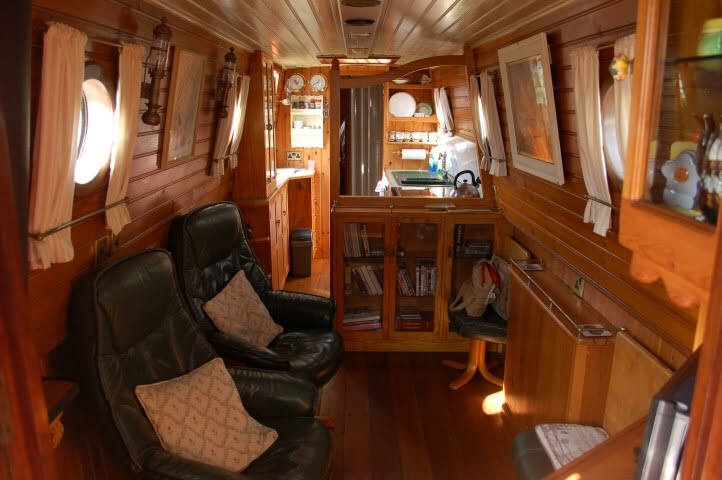 Now we live on a superbly equipped narrowboat fit for life on board in all weather. We both look forward to welcoming you on board for a fun packed day that you will remember for many years to come. If you’re nervous about spending ten hours, a full day, with two complete strangers, don’t be. I was nervous about meeting people like you when I created the service in 2014. I’ve welcomed hundreds of guests on board since then. They’ve all had a wonderful time. 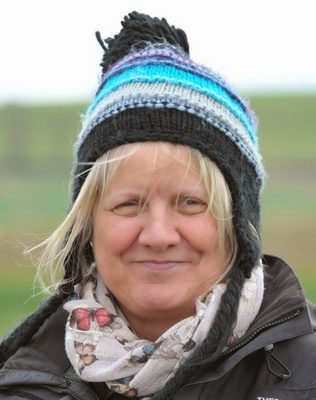 Cynthia is relatively new to narrowboating, but not to playing mine host. She spent most of her working life as first class cabin crew for American Airlines. Even though she’s been retired for a few years old habits die hard. You won’t be offered complimentary champagne when you step on board, but you will be greeted by the biggest and most sincere smile you’re ever likely to see. Both of us will be very happy to have you on board. If you haven’t received one already, in the next day or two, you should receive an email from me asking your priorities for the day. I’ll use your information to tailor your day to suit your requirements, but your needs will probably be similar to those of most of my discovery day guests. You’ll want to know as much as possible about living afloat and the pros and cons of different bits of kit, narrowboat styles and layouts. 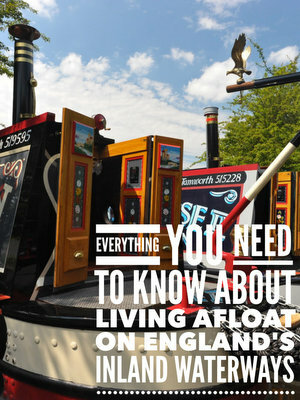 You’ll probably also want to learn how to handle a narrowboat either as part of a crew or as a solo boater. You’ll meet me at 8 am at my usual starting point on the Grand Union canal above Calcutt Top lock. I’ll spend an hour or so walking you through my boat with you before we set off. 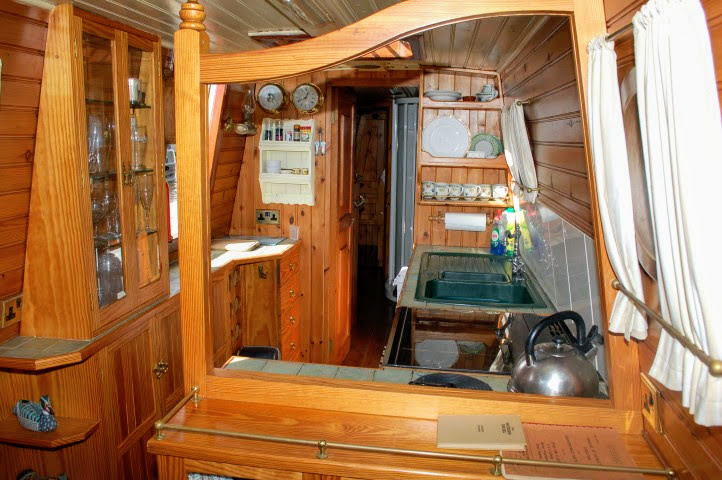 I’ll show you what I think is a pretty robust setup for a liveaboard narrowboat designed for long-term off-grid cruising. I welcome any questions about our boat, our itinerant lifestyle or canal culture in general at any time during your time with us. We’ll talk about boat designs, different sterns, heating and electrical systems and, of course, we’ll have the inevitable and lengthy boater’s debate about the pros and cons of different narrowboat toilets. Then we’ll set off on a seven to eight-hour cruise. YOU will be at the helm of my twenty tonnes, 62′ long narrowboat with its 1936 Lister engine. I’ll stand behind you throughout the day ready to lend a helping hand if you feel you need it. I’ll intervene as little or as often as you want. The day is yours. There’s no pressure. My goal is to educate you, teach you, but most importantly, to entertain you. You can look forward to a truly relaxing and hugely enjoyable day out. I’ve lost count of the number of times we’ve moored at the end of an idyllic day on the cut to be asked where my guests can find the nearest narrowboat broker. You have been warned. You are likely to enjoy your day out with us so much that you’ll consider living afloat. My usual route is along the shared Oxford and Grand Union canal route to Braunston Junction. We’ll stop for coffee after an hour, often at my favourite spot. We’ll moor in the shade of a majestic weeping willow with a breathtaking view of endless hedge-fringed fields and rolling hills. We’ll cruise into the centre of Braunston where you’ll execute a perfect three-point turn in Braunston marina entrance, and then we’ll head back towards Calcutt. We’ll stop en route for lunch and coffee so you’ll be able to practice “parking”. The stresses and strains of modern day life will be far behind you. Much of our route is far away from roads and intrusive traffic noise. You’ll be mesmerised by the sounds of birds singing in the hedgerows, farm tractors rolling slowly through ploughed fields and the ever-present hypnotic beat of our boat’s two-cylinder engine. (That’s not our actual engine, but that what it sounds like). Isn’t it lovely? To finish the day, you’ll take my boat in and out of six wide (double) locks, three downstream and three upstream. There’s always plenty going on at the Calcutt flight of three locks so you can expect an exciting experience. I’ve chosen this route because of the challenge and variety offered by the twists and turns and narrow bridges of a contour canal and the accessible and fascinating three lock flight. There are two other options if you would like more lock experience. However, the lock heavy day means less cruising and less time on the boat walkthrough at the beginning of the day. If plenty of locks are essential to you, please let me know before you arrive. That’s it. If you want to know anything else, please let me know. If not, I look forward to meeting you on your discovery day. We’re going boating in England. The weather may be beautiful. On the other hand, it may be typically English. Be prepared. Comfortable casual clothing – You’re going to be climbing on and off a boat and in and out of locks. Wear clothing which will not restrict movement and which you don’t mind getting dirty. Warm clothing if you are coming in the colder months (or on a typical English summer’s day). I’ve now done quite a few winter discovery days. Guests often laugh when they see me at the start of the day looking like the Michelin Man. However, after six or seven hours standing still at the tiller on a frosty winter’s day, they can usually see those aesthetics aren’t nearly as important as comfort. Bring more warm clothes than you think you will need. You can always take some off. Sensible footwear. The boat, the footpath and the locks can be either muddy or slippery or both. Make sure your footwear is comfortable, has grippy soles and is preferably waterproof. Indoor footwear if you need it. The boat is our home, and we (Cynthia and I) try very hard to keep it clean. We don’t wear our shoes in the house. We wear “slippers”. They’re Crocs which are lovely for protecting our feet from a floor which can be quite cold in the winter. I hope you don’t mind, but I’m going to ask you to remove your outdoor shoes before you come inside. A packed lunch. There are very few opportunities to buy food on our route. Don’t worry about hot and cold drinks. We will supply all you need. A notebook and a pen. We’ll be covering a lot of subjects so you’ll want to record much of the knowledge you gain during your day. Last but not least, bring a sense of fun and adventure. Cruising the inland waterways on a narrowboat is all about relaxing and enjoying yourself. You will learn a great deal during your ten hours afloat, but the emphasis will be very much on having a good time. Ten hours may sound a long time to you. You’ll be amazed how quickly it passes. Your day begins at 8 am and finishes at 6 pm. We stop a little earlier on December Discovery Days. There’s not enough light to navigate safely. We tackle six locks at the end of the day so that you have built confidence after six hours at the helm. Nighttime lock negotiation is possible but not advisable. You may wish to stay somewhere locally the previous night if you have to drive any distance. I have detailed an excellent nearby Bed & Breakfast below. Please remember that this is YOUR day. I’m not going to shout at you if you’re late but, if you want to make the most of your day with me, try to arrive on time. We have a lot to get through. If you’re late we’ll have to cut something out. I don’t want that to happen. I’m sure you don’t either. There’s a cracking canalside B&B a short walk away from Calcutt Top Lock where your day begins. It’s called Wigrams. Owner Ben Heaf welcomes Discovery Day guests. He knows that they are decent people who are usually very excited about spending the day on the cut. He makes sure that they have a good breakfast before they set off. Wigrams is on the canal at Napton Junction. It’s a pleasant ten-minute stroll along the towpath to where I moor for the start of my Discovery Day service. If you live a few hours car drive from my location, a night at Wigrams is the perfect way to ensure a good start to a great day.